Give these administrative managers a memo! Buy this targeted directors of administration email list of decision-makers organized by job title and grab the direct contact information of a director of administration, an office manager, or another administrative management position. Office managers and directors of administration manage staff on a grand scale. They're very important people to get a hold of, and if you need an administrative manager database of highly qualified contacts, then this is the ready-made, B2B email list you should give to your sales team. Email verified office management and administrative leads when you focus on the professionals who have the power to make important buying decisions. Get the human-verified direct contact information of the best sales leads in minutes. This office manager email list contains real, full emails (not just generic addresses) and other important information. 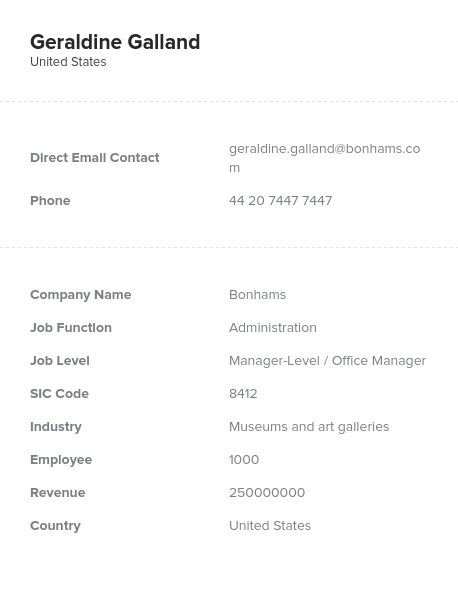 You can use this administration managers mailing list to send direct mail, use their phone numbers for cold-calling, and send out blast emails to official managers and directors of administration. Skip to the higher levels of administration and talk to those who manage staff, complete organizational tasks, and make sure operations run smoothly. They need all kinds of software and people to get their jobs done and often problem-solve by implementing new solutions. Your product or service can be that solution! Buy an administrative email database of administration directors, managers, and decision-makers. Get to work quickly and make deals, helping these office managers make positive changes to their companies.